French President calls Netanyahu to discuss Iran, stresses France's determination that Iran should suspend its nuclear program. France on Wednesday joined a chorus of nations urging a peaceful solution to the Iran nuclear crisis, as French President Francois Hollande urged Prime Minister Binyamin Netanyahu to favor diplomacy. 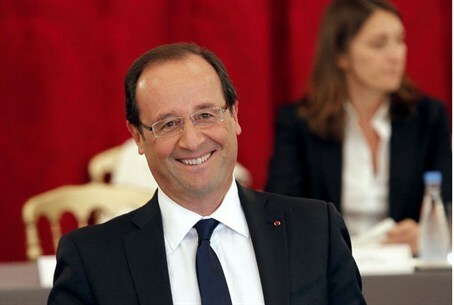 AFP reported that Hollande made the comments in a telephone conversation with Netanyahu. A statement from the French President’s office stated that Hollande stressed France's determination that Iran should suspend its controversial nuclear program and respect UN Security Council resolutions on the issue. Over the past week, Netanyahu has repeatedly driven home the need to draw a “clear red line” for Iran and make clear the consequences of crossing it. U.S. Secretary of State Hillary Clinton responded to Netanyahu’s comments, saying the Obama administration has no “deadline” for Iran. Clinton said in an interview that negotiations still are “by far the best approach” to prevent Iran from developing nuclear weapons. On Tuesday, Netanyahu insisted that the international community could not ask Israel to keep waiting before acting against Iran if it had not laid down red lines to Tehran over its nuclear program. President Barack Obama later called Netanyahu to discuss the issue, after the White House announced that the President would not meet Netanyahu in New York on the sidelines of the United Nations General Assembly. “It was a good phone conversation,” Mark Regev, spokesman for Netanyahu, told AFP Wednesday. “The president and the prime minister agreed to work together. The common goal is to stop Iran's nuclear weapon program,” he added. Meanwhile, a British newspaper reported on Wednesday that the head of Britain's foreign intelligence agency MI6 had visited Israel to warn Netanyahu against military action on Iran. The Daily Mail said that John Sawers had gone to Israel around two weeks ago with a message from Prime Minister David Cameron urging Netanyahu to allow more time for a diplomatic solution.